Meeting Meanest Man Contest is like shaking hands with a newborn cloud. Their compositions unfold and bloom before wide-open ears. Ever growing shapes elevate from simple states. Tones roll out layers for crackling drums to bounce on. Words streams burst the surface to bless dry speakers. Undulating syncopation reconstructs the unexpected. Merit is floating abstraction grounded in strong urban influence. Meanest Man Contest is based in the fog shrouded music hotbed of Oakland, California. The secret duo unveiled are > Quarterbar (beats) and Eriksolo (vocals). These fresh beat veterans build on strong roots. As founders of the indie hip-hop labels Rocketship and Weapon Shaped Records they released music from Anticon, the Shapeshifters, Substance Abuse, and Emanon. Meanest Man Contest radiate buzz with compilation and 7 inch appearances. MMC climb to the top with hushed electricity. 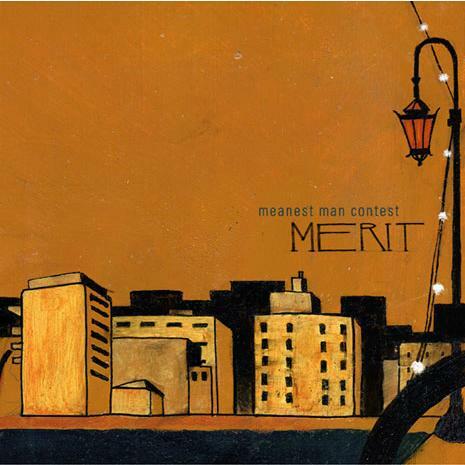 Merit is a drunken jazz serenade. Sound silhouettes filtered though smoky shafts of light. Don’t be fooled by the sway & wobble. Meanest Man Contest punch out lights with heavy drum swings. Creaky organs wail from floor cracks, rhythms ride skyward on glistening guitar strings, and cymbal-spun ceiling fans keep it cool. Merit’s compositions are comfortable like cracked leather booths. Meanest Man Contest offer a newsflash for fans of dj Vadim, dj Krush, and Prefuse 73. Choose a Format: -- Please Select -- CD (Digi pack) Vinyl 12"